When I went to the UW I'd buy a shiny new spiral for each class at the beginning of the quarter and dutifully kept all my notes. I don't know why, I wasn't an exceptional note taker or anything. Recently going through them I realized how empty of markings some of the note books are. 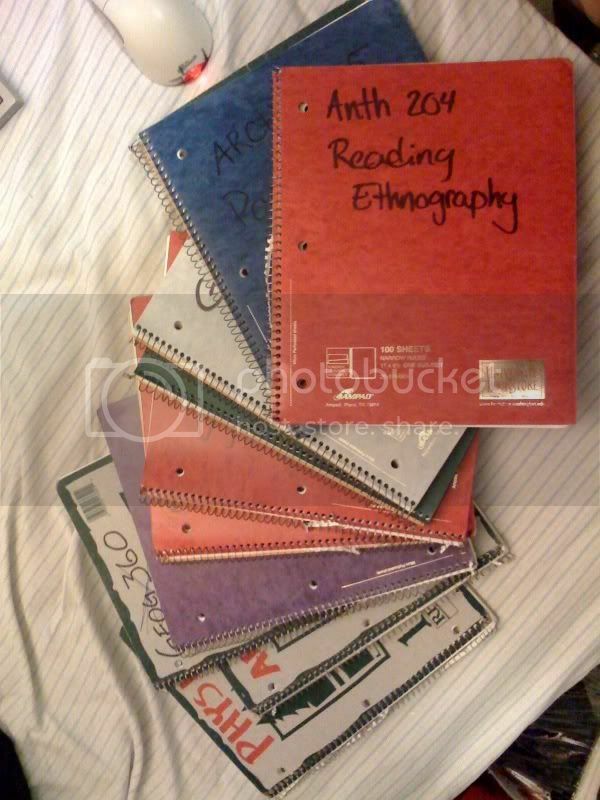 I decided to tear out the papers I wrote on and see if any poor college student could use 11 free spiral note books. They have 50-99% of their blank paper left. They all must go as one family, I don't want them being separated. They've spent a long time in a box together and have become really attached. They all have the class # on the front and my contact info inside the front cover. Not the most attractive but this paper should get used at least once before it gets recycled. You pick up in Northgate.